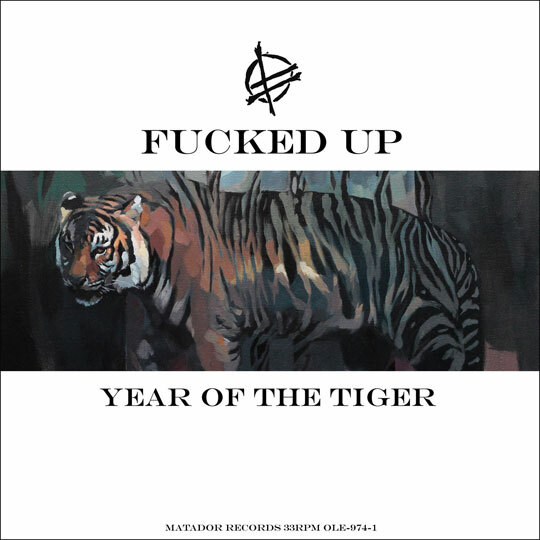 Since 2006, Fucked Up have released a 12″ single on each Chinese New Year. Named after the beasts in the Chinese Zodiac, “Year Of The Tiger” is the latest in the series. The song is an progressive rock anthem featuring guest vocalists Jim Jarmusch, Annie-Claude Deschênes and Austra. It was produced by Shane Stoneback (Vampire Weekend, Sleigh Bells) during the sessions for last year’s critically acclaimed rock opera David Comes To Life. The 15-minute long track features the band’s well-known layers of guitar and roaring vocals, taken to a new level with the addition of piano, Jarmusch’s dark recitations and Deschênes’s gorgeous crescendos, in this menacing but uplifting story about the predation of predators. The B-side “ONNO” is a 22-minute long palindromic drone. It explores new realms for the band, opening up new landscapes of space and hypnotic repetition. $1 from the sale of each record will go to Save Tigers Now. You can preorder the 12″ from the Matador Store. Just thought I’d let you know that I run the Fucked Up Facebook page, not the one that you posted a link for …but the one that gets updated pretty much everyday and all of the FU fans check religiously…..you should check it out. I know the group well Joe! Added the link. I’m sure the A-side sounds great, but after reading the description for “ONNO,” I really want to hear the flip! Do you know if the vinyl will come with a download code for an MP3 version of it?